Dentine is covered and protected by hard tissues such as enamel or cementum. Dentin itself is a vital tissue, consisting of dentinal tubules, and is naturally sensitive because of extensions of odontoblasts and formation of dentine-pulp complex. Although dentin and pulp are histologically different, their origin is embryologically from the same precursor, i.e., the ectomesenchyme. Pulp is integrally connected to dentine, i.e., physiologic and/or pathologic reactions in one of the tissues will also affect the other. Dentin consists of small canal like spaces, dentinal tubules. These tubules occupied by odontoblastic processes. The odontoblastic processes may extend through the entire thickness of dentin from pulp to dentino-enamel junction. The odontoblastic processes are actually the extensions of odontoblasts, which are the major cells of pulp-dentin complex. The odontoblastic processes are surrounded by dentinal fluid inside the tubules. The dentinal fluid forms around 22% of total volume of dentin. It is an ultrafiltrate of blood from the pulp via dentinal tubules and forms a communication medium between the pulp (via the odontoblastic layer) and outer regions of the dentin. It has been stated in the literature that DH develops in two phases: lesion localization and lesion initiation. 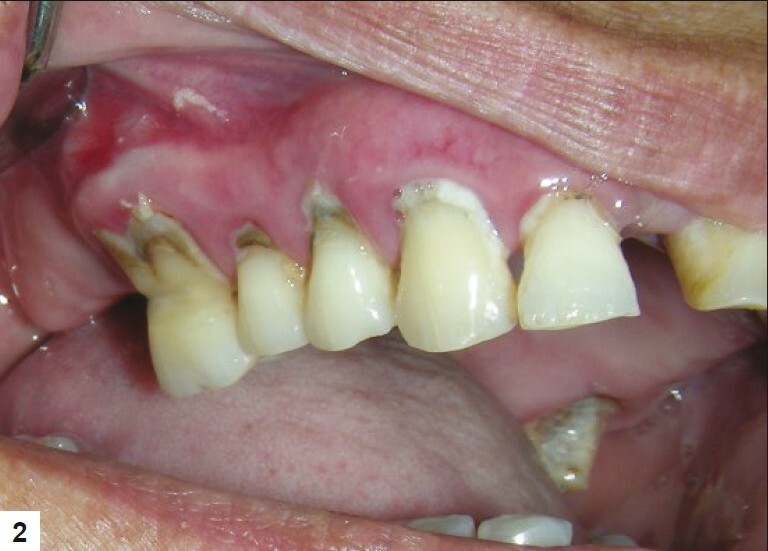 Lesion localization occurs by loss of protective covering over the dentin, thereby exposing it to external environment. It includes loss of enamel via attrition, abrasion, erosion or abfraction. Another cause for lesion localization is gingival recession which can be due to toothbrush abrasion, pocket reduction surgery, tooth preparation for crown, excessive flossing or secondary to periodontal diseases. As stated earlier, not all exposed dentine is sensitive. For DH to occur, the lesion localization has to be initiated. It occurs after the protective covering of smear layer is removed, leading to exposure and opening of dentinal tubules. According to direct innervation theory, nerve endings penetrate dentine and extend to the dentino-enamel junction. Direct mechanical stimulation of these nerves will initiate an action potential. There are many shortcomings of this theory. There is lack of evidence that outer dentin, which is usually the most sensitive part, is innervated. Developmental studies have shown that the plexus of Rashkow and intratubular nerves do not establish themselves until the tooth has erupted; yet, newly erupted tooth is sensitive. Moreover, pain inducers such as bradykinin fail to induce pain when applied to dentine, and bathing dentine with local anesthetic solutions does not prevent pain, which does so when applied to skin. Faulty tooth brushing includes hard brushes, excessive forces, excessive scrubbing at the cervical areas or even lack of brushing which causes plaque accumulation and gingival recession [Figure 2] and [Figure 3]. The patient should be taught the correct method of tooth brushing with the help of a model. Highly abrasive tooth powder or pastes should be avoided. Also, the patients should be instructed to avoid brushing for at least 2 hours after acidic drinks to prevent agonist effect of acidic erosion on tooth brush abrasion. Erosive agents are also important agents in initiation and progression of DH [Figure 4]. They tend to remove the enamel or open up the dentinal tubules. , The erosive agents can be either exogenous dietary acids or endogenous acids. The exogenous dietary acids include carbonated drinks, citrus fruits, wines, yogurt, and professional hazards (workers in battery manufacturing, wine tasters). , A detailed dietary history should be taken. The quantity and frequency of the foods containing acids should be reduced. Patient should be advised to take something alkaline (milk) or at least neutral (water) after acidic drinks and to use a straw to sip the drink and avoid swishing it around the teeth. The endogenous acid comes from gastroesophageal reflux or regurgitation. It is also common in patients with eating disorders. 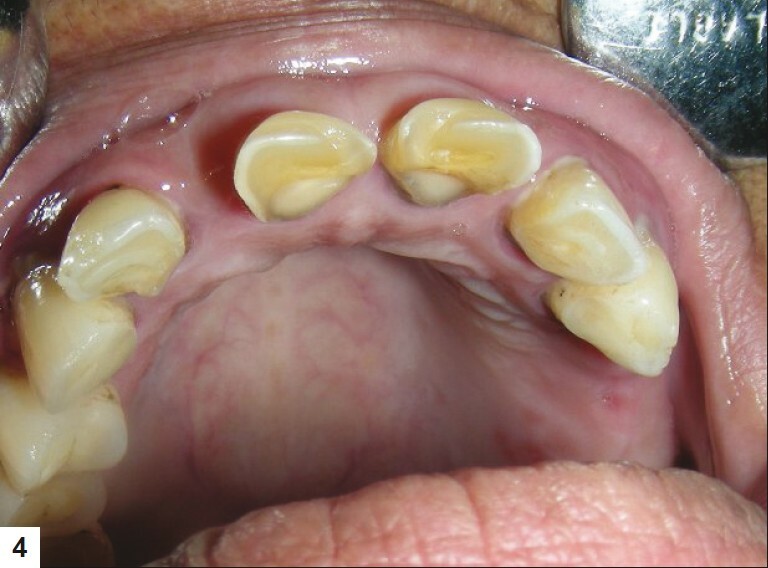 The condition is characterized by generalized erosion of the palatal surfaces of maxillary anterior teeth. Such a patient should be referred to the medical practitioner for expert management of the underlying disease. An occlusal splint can be fabricated to cover the affected areas, to prevent their contact with the acids. Grossman  listed the requirements for an ideal dentine desensitizing agent as: rapidly acting with long-term effects, non-irritant to pulp, painless and easy to apply, and should not stain the tooth. Traditionally, the therapy for management of DH is primarily aimed at occluding the dentinal tubules or making coagulates inside the tubules. Patients are often prescribed over-the-counter desensitizing agents. These "at home" desensitizing agents include toothpastes, mouthwashes and chewing gums. Majority of the toothpastes contain potassium salts (potassium nitrate, potassium chloride or potassium citrate), sodium fluoride, strontium chloride, dibasic sodium citrate, formaldehyde, sodium monofluorphosphate and stannous fluoride. Potassium salts act by diffusion along the dentinal tubules and decreasing the excitability of the intradental nerve fibers by blocking the axonic action. , Various clinical studies have shown the efficacy of potassium salts in controlling the DH. , It has been shown that toothpastes containing 5% potassium nitrate and 0.454% stannous significantly reduced the DH. Also, toothpastes containing potassium nitrate and fluorides have been shown to reduce post-bleaching sensitivity. , The desensitizing toothpastes should be used with the help of a toothbrush with soft bristles. Patients should be advised to use minimal amount of water to prevent the dilution of the active agent. Along with the desensitizing toothpastes, mouthwashes and chewing gums containing potassium nitrate, sodium fluoride or potassium citrate are also recommended. The results of "at-home" desensitizing therapy should be reviewed after every 3-4 weeks. If there is no relief in DH, "in-office" therapy should be initiated. Theoretically, the in-office desensitizing therapy should provide an immediate relief from the symptoms of DH. The in-office desensitizing agents can be classified as the materials which undergo a setting reaction (glass ionomer cement, composites) and which do not undergo a setting reaction (varnishes, oxalates). Traditionally, fluorides have been used as a caries preventive material which can help in remineralization of enamel/dentin. Also, various clinical trials have shown that application of fluoride solution can decrease the DH. , Fluorides decrease the dentinal permeability by precipitation of calcium fluoride crystals inside the dentinal tubules. These crystals are partially insoluble in saliva. SEM revealed granular precipitates in the peritubular dentin after application of fluorides. Various fluoride formulations are used to treat DH. These include sodium fluoride, stannous fluoride, sodium monofluorophosphate, fluorosilicates and fluoride combined with iontophoresis. Sodium fluoride has been used in dentifrices or may be professional applied in a concentration of 2%. The precipitates formed by sodium fluoride can be mechanically removed by the action of saliva or mechanical action. Therefore, an addition of acid formulation is recommended. The acidulated sodium fluoride can form precipitates deep inside the tubules. Also, some authors have recommended the use of ionotophoresis along with sodium fluoride. , The electric current is supposed to increase the ion diffusion. A clinical study has shown that 0.4% stannous fluoride along with 0.717% of fluoride can provide an immediate affect after a 5 minute professional application. Stannous fluoride acts in a similar fashion as that of sodium fluoride, i.e., formation of calcium fluoride precipitates inside tubules. Also, SEM studies have shown that stannous fluoride itself can form insoluble precipitates over the exposed dentine. Fluorosilicates act by formation of precipitates of calcium phosphates from saliva. Ammonium hexafluorosilicate has been used as a desensitizing agent. It can present a continuous effect of dentinal tubule occlusion via precipitation of a mixture of calcium fluoride and fluoridated apatite. , If the precipitate is predominantly composed of fluoridated apatite, it can form stable crystals deposited deep inside the dentinal tubules. , These crystals are resistant to removal from the action of saliva, brushing or action of dietary substances. Oxalates can reduce dentinal permeability and occlude dentinal tubules. Thirty percent potassium oxalate had shown a 98% reduction in dentinal permeability. Also, topical application of 3% potassium oxalate reduced DH after periodontal therapy. The oxalate reacts with the calcium ions of dentine and forms calcium oxalate crystals inside the dentinal tubules as well as on the dentinal surface. This results in a better sealing as compared with an intact smear layer. It has been shown that the effect of oxalates on DH diminishes over a period of time. This can be attributed to the removal of the calcium oxalate crystals by brushing or dietary acids. The condition can be improved by acid etching of the dentinal surface, thus increasing the penetration of calcium oxalate crystals deep into the dentinal tubules. Many vegetables like rhubarb, spinach and mint contain oxalates. It has been shown that phytocomplexes obtained from these natural products can reduce the dentinal permeability. This can also be followed by covering the exposed surface with a dental adhesive. Potassium oxalate can lead to gastric irritation. Therefore, it should not be used with a tray with prolonged placement. Bioglass was developed to stimulate the formation of new bone. It is used in orthopedics to cover the implants to promote union between implant and bone. , It has been used in dentistry to fill up the osseous defects during periodontal surgery. It has been reported that a formulation of bioglass can promote infiltration and remineralization of dentinal tubules. The basic component is silica, which acts as a nucleation site for precipitation of calcium and phosphate. SEM analysis has shown that bioglass application forms an apatite layer, which occludes the dentinal tubules. The use of bioglass in management of DH has been shown by some products such as NovaMin (NovaMin Technology Inc., FL, USA). Some authors have shown that calcium silicate cement derived from Portland cement can help in the management of DH. It helps to occlude the dentinal tubules by remineralization. Recently, milk protein casein has been used to develop a remineralizing agent (GC Tooth Mousse). The casein phosphopeptide (CPP) contains phosphoseryl sequences which get attached and stabilized with amorphous calcium phosphate (ACP). The stabilized CPP-ACP prevents the dissolution of calcium and phosphate ions and maintains a supersaturated solution of bioavailable calcium and phosphates. Various studies have shown that CPP-ACP can effectively remineralize the enamel subsurface lesions. , By virtue of its remineralizing capacity, it has also been proposed by the manufacturers that it can also help in prevention and treatment of DH. Take a detailed clinical and dietary history. Differentially diagnose the condition from other dental pain conditions. Identify and manage etiological and predisposing factors. In case of mild-to-moderate sensitivity, advice at-home desensitizing therapy. If there is no relief or in case of severe sensitivity, initiate in-office treatment. In extreme cases, if patient does not respond to the therapy and there are individual teeth exhibiting the symptoms, then endodontic therapy can be initiated. A regular review should be made with an emphasis on prevention of the condition. 1. Addy M. Dentine hypersensitivity: Definition, prevalence distribution and aetiology. In: Addy M, Embery G, Edgar WM, Orchardson R, editors. Tooth wear and sensitivity: Clinical advances in restorative dentistry. London: Martin Dunitz; 2000. p. 239-48. 2. Addy M. Etiology and clinical implications of dentine hypersensitivity. Dent Clin North Amer 1990;34:503-14. 3. Trowbridge HO. Mechanism of pain induction in hypersensitive teeth. In: Rowe NH, editor. Hypersensitive dentine: Origin and management. Ann Arbor, USA: University of Michigan; 1985. p. 1-10. 4. Gillam DG, Orchardson R. Advances in the treatment of root dentin sensitivity: Mechanisms and treatment principles. Endod Topics 2001;13:13-33. 5. Clayton DR, McCarthy D, Gillam DG. A study of the prevalence and distribution of dentine sensitivity in a population of 17-58-year-old serving personnel on an RAF base in the Midlands. J Oral Rehab 2002;29:14-23. 6. Absi EG, Addy M, Adams D. Dentine hypersensitivity: A study of the patency of dentinal tubules in sensitive and non sensitive cervical dentine. J Clin Periodontol 1987;14:280-4. 7. Rimondini L, Baron C, Carrassi A. Ultrastructure of hypersensitive and non-sensitive dentine. J Clin Periodontol 1995;22:899-902. 8. Holland GR, Narhi MN, Addy M, Gangarosa L, Orchardson R. Guidelines for the design and conduct of clinical trials on dentine hypersensitivity. J Clin Periodontol 1997;24:808-13. 9. 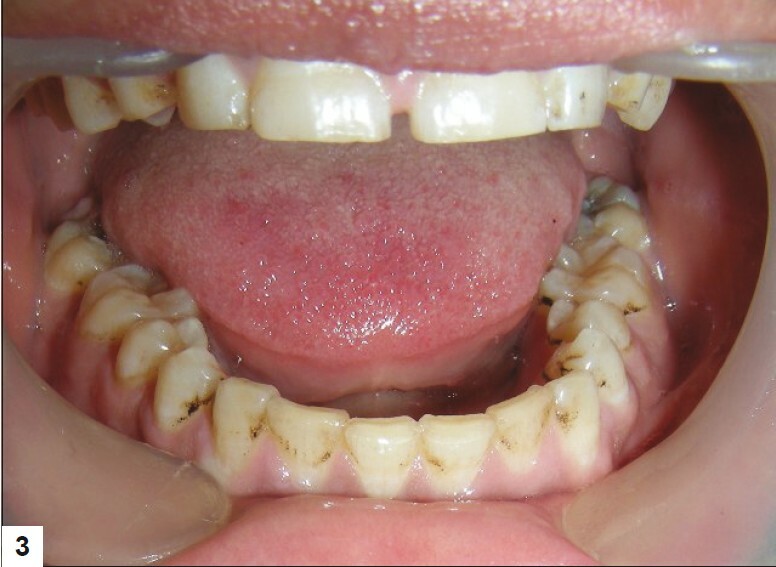 Addy M. Dentine hypersensitivity: New perspectives on an old problem. Int Dent J 2002;52:367-75. 10. Rees JS, Jin U, Lam S, Kudanowska I, Vowles R. The prevalence of dentine hypersensitivity in a hospital clinic population in Hong Kong. J Dent 2003;31:453-61. 11. Flynn J, Galloway R, Orchardson R. The incidence of hypersensitive teeth in the west of Scotland. J Dent 1985;13:230-6. 12. Fischer C, Fischer RG, Wennberg A. Prevalence and distribution of cervical dentine hypersensitivity in a population in Rio de Janeiro, Brazil. J Dent 1992;20:272-6. 13. Irwin CR, McCusker P. Prevalence of dentine hypersensitivity in general dental population. J Irish Dent Assoc 1997;43:7-9. 14. Taani DQ, Awartani F. Prevalence and distribution of dentin hypersensitivity and plaque in a dental hospital population. Quintessence Int 2001;32:372-6. 15. Addy M, Mostafa P, Newcombe RG. 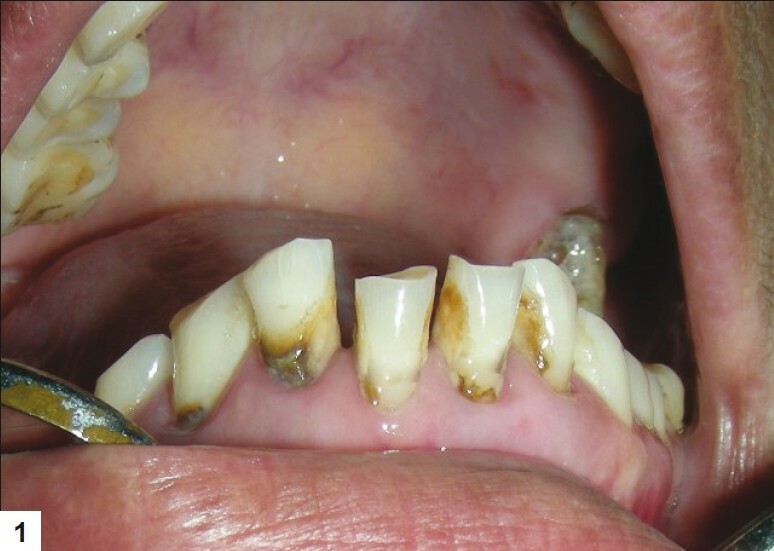 Dentine hypersensitivity: The distribution of recession, sensitivity and plaque. J Dent 1987;15:242-8. 16. Orchardson R, Cadden SW. An update on the physiology of the dentine-pulp complex. Dent Update 2001;28:200-9. 17. Orchardson R, Gilliam D. Managing dentin hypersensitivity. J Am Dent Assoc 2006;137:990-8. 18. Dababneh R, Khouri A, Addy M. Dentine hypersensitivity: An enigma? A review of terminology, epidemiology, mechanisms, aetiology and management. Br Dent J 1999;187:606-11. 19. Irvine JH. Root surface sensitivity: A review of aetiology and management. J N Z Soc Periodontol 1988;66:15-8. 20. Rapp R, Avery JK, Strachan DS. Possible role of the acetylcholinesterase in neural conduction within the dental pulp. In: Finn SB, editor. Biology of the dental pulp organ. Birmingham: University of Alabama Press; 1968. p. 309-31. 21. Pashley DH. Dynamics of the pulpo-dentinal complex. Crit Rev Oral Biol Med 1996;7:104-33. 22. Brδnnstrom M, Astrom A. A Study on the mechanism of pain elicited from the dentin. J Dent Res 1964;43:619-25. 23. Chidchuangchai W, Vongsavan N, Matthews B. Sensory transduction mechanisms responsible for pain caused by cold stimulation of dentine in man. Arch Oral Biol 2007;52:154-60. 24. Minoux M, Serfaty R. Vital tooth bleaching: Biologic adverse effects - A review. Quintessence Int 2008;39:645-59. 25. Dowell P, Addy M. Dentine Hypersensitivity: A review: Aetiology, symptoms and theories of pain production. J Clin Periodontol 1983;10:341-50. 26. Gillam DG, Orchardson R. Advances in the treatment of root dentin sensitivity: Mechanisms and treatment principles. Endod Topics 2006;13:13-33. 27. Suge T, Kawasaki A, Ishikawa K, Matsuo T, Ebisu S. Effects of plaque control on the patency of dentinal tubules: An In vivo study in beagle dogs. J Periodontol 2006;77:454-9. 28. Eisenburger M, Addy M. Erosion and attrition of human enamel In vitro. Part I: Interaction effects. J Dent 2002;30:341-7. 29. Osborne-Smith KL, Burke FJ, Wilson NH. The aetiology of the non-carious cervical lesion. Int DentJ 1999;49:139-43. 30. Mayhew RB, Jessee SA, Martin RE. Association of occlusal, periodontal, and dietary factors with the presence of non-carious cervical dental lesions. Am J Dent 1998;11:29-32. 31. Grossman L. A systematic method for the treatment of hypersensitive dentine. J Am Dent Assoc 1935;22:592-8. 32. Markowitz K, Bilotto G, Kim S. Decreasing intradental nerve activity in the cat with potassium and divalent cations. Arch Oral Biol 1991;36:1-7. 33. Peacock JM, Orchardson R. Effects of potassium ions on action potential conduction in A- and C-fibers of rat spinal nerves. J Dent Res 1995;74:634-41. 34. Hodosh M. A superior desensitizer: Potassium nitrate. J Am Dent Assoc 1974;88:831-2. 35. Frechoso SC, Menendez M, Guisasola C, Arregui I, Tejerina JM, Sicilia A. Evaluation of the efficacy of two potassium nitrate bioadhesive gels (5% and 10%) in the treatment of dentine hypersensitivity: A randomised clinical trial. J Clin Periodontol 2003;30:315-20. 36. Schiff T, Zhang YP, DeVizio W, Stewart B, Chaknis P, Petrone ME, et al. A randomized clinical trial of the desensitizing efficacy of three dentifrices. Compend Contin Educ Dent Suppl 2000;27:4-10. 37. Sowinski JA, Battista GW, Petrone ME, Chaknis P, Zhang YP, DeVizio W, et al. A new desensitizing dentifrice: An 8-week clinical investigation. Compend Contin Educ Dent Suppl 2000;21:11-6. 38. Paine ML, Slots J, Rich SK. Fluoride use in periodontal therapy: A review of the literature. J Am Dent Assoc 1998;129:69-77. 39. Morris MF, Davis RD, Richardson BW. Clinical efficacy of two dentin desensitizing agents. Am J Dent 1999;12:72-6. 40. Leonard RH Jr, Smith LR, Garland GE, Caplan DJ. Desensitizing agent efficacy during whitening in an at-risk population. J Esthet Restor Dent 2004;16:49-55. 41. Kern DA, McQuade MJ, ScheidtMJ, Hanson B, Van Dyke TH. Effectiveness of sodium fluoride on tooth hypersensitivity with and without iontophoresis. J Periodontol 1989;60:386-9. 42. Gangarosa LP, Park NH. Practical considerations in iontophoresis of fluoride for desensitizing dentin. J Prosthet Dent 1978;39:173-8. 43. Thrash WJ, Dodds MW Jones DL. The effect of stannous fluoride on dentinal hypersensitivity. Int Dent J 1994;44:107-18. 44. Morris MF, Davis RD, Richardson BW. Clinical efficacy of two dentin desensitizing agents. Am J Dent 1999;12:72-6. 45. Suge T, Kawasaki A, Ishikawa K, Matsuo T, Ebisu S. Ammonium hexafluorosilicate elicits calcium phosphate precipitation and shows continuous dentin tubule occlusion. Dent Mater 2008;24:192-8. 46. Suge T, Kawasaki A, Ishikawa K, Matsuo T, Ebisu S. Effect of ammonium hexafluorosilicate on dentin tubule occlusion for the treatment of dentin hypersensitivity. Am J Dent 2006;19:248-52. 47. Pillon FL, Romani IG, Schmidt ER. Effect of a 3% potassium oxalate topical application on dentinal hypersensitivity after subgingival scaling and root planing. J Periodontol 2004;75:1461-4. 48. Hongpakmanoon W, Vongsavan N, Soo-ampon M. Topical application of warm oxalate to exposed human dentine In vivo. J Dent Res 1999;78:300. 49. Sauro S, Gandolfi MG, Prati C, Mongiorgi R. Oxalate-containing phytocomplexes as dentine desensitizers: An In vitro study. Arch Oral Biol 2006;51:655-64. 50. Hack GD, Thompson VP. Occlusion of dentinal tubules with cavity varnishes. Archs Oral Biol 1994;39:S149. 51. Duran I, Sengun A. The long-term effectiveness of five current desensitizing products on cervical dentine sensitivity. J Oral Rehab 2004;31:351-6. 52. Prati C, Cervellati F, Sanasi V, Montebugnoli L. Treatment of cervical dentin hypersensitivity with resin adhesives: 4-week evaluation. Am J Dent 2001;14:378-82. 53. Baysan A, Lynch E. Treatment of cervical sensitivity with a root sealant. Am J Dent 2003;16:135-8. 54. Dondi dall'Orologio G, Lone A, Finger WJ. Clinical evaluation of the role of glutardialdehyde in a one-bottle adhesive. Am J Dent 2002;15:330-4. 55. Dondi dall'Orologio G, Lorenzi R, Anselmi M, Grisso V. Dentindesensitizing effects of Gluma Alternate, Health-Dent Desensitizer and Scotchbond Multi-Purpose. Am J Dent 1999;12:103-6. 56. Hench LL, Splinter RJ, Allen WC, Greenlee TK. Bonding mechanisms at interface of ceramic prosthetic materials. J Biomed Mater Res Symp 1971;2:117-41. 57. Hench LL, Paschall HA. Direct chemical bond of bioactive glass-ceramic materials to bone and muscle. J Biomed Mater Res Symp 1973;4:24-42. 58. Wilson J, Low SB. Bioactive ceramics for periodontal treatment: Comparative studies in the patus monkey. J Appl Biomater 1992;3:123-9. 59. Forsback AP, Areva S, Salonen JI. Mineralization of dentin induced by treatment with bioactive glass S53P4 In vitro. Acta Odontol Scand 2004;62:14-20. 60. Kimura Y, Wilder-Smith P, Yonaga K, Matsumoto K. Treatment of dentine hypersensitivity by lasers: A review. J Clin Periodontol 2000;27:715-21. 61. McCarthy D, Gillam DG, Parson DJ. In vitro effects of laser radiation on dentine surfaces. J Dent Res 1997;76:233. 62. Schwarz F, Arweiler N, Georg T, Reich E. Desensitizing effects of an Er: YAG laser on hypersensitive dentine. J Clin Periodontol 2002;29:211-5. 63. Corona SA, Nascimento TN, Catirse AB, Lizarelli RF, Dinelli W, Palma-Dibb RG. Clinical evaluation of low-level laser therapy and fluoride varnish for treating cervical dentinal hypersensitivity. J Oral Rehabil 2003;30:1183-9. 64. Reynolds EC. Remineralization of enamel subsurface lesions by casein phosphopeptide-stabilized calcium phosphate solutions. J Dent Res 1997;76:1587-95. 65. Cai F, Shen P, Morgan MV, Reynolds EC. Remineralization of enamel subsurface lesions in-situ by sugar free lozenges containing casein phosphopeptide - amorphous calcium phosphate. Aust Dent J 2003;48:240-3. 66. Lata S, Varghese NO, Varughese JM. Remineralization potential of fluoride and amorphous calcium phosphate-casein phospho peptide on enamel lesions: An In vitro comparative evaluation. J Conserv Dent 2010;13:42-6. 4 Discussion: how can we improve diagnosis of dentin hypersensitivity in the dental office?